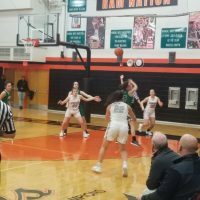 The Galesburg Silver Streaks‘ season comes to an end, after losing to the Peoria Notre Dame Irish at the IHSA Class 3A Peoria Manual Regional Wednesday, 56-40. The Streaks did not shoot the ball well throughout the game, 13 for 46 overall from the field, just four from 20 behind the three-point arc. On the other hand, Notre Dame shot over 50% for the game, hitting 22 of 41 shots. Otherwise, it was not a horrible game for the Streaks. They only turned the ball over nine times, versus 12 for Notre Dame. It was Andrea Sampson and Riley Jenkins leading the way for the Streaks with 11 points apiece. Sampson also had four rebounds, three assists, and two steals — and was the Dave’s Autobody Crunch Time Player of the Game. Chloe McCarthy had nine points and five rebounds. Daija Range had five points and ten rebounds in her final game as a Streak. The teams played even on the boards with 26 rebounds each, but Galesburg had the edge in offensive rebounds. Sam Vallianatos led the Irish with 15 points. Lexi Snyder had 11. The Streaks finish the season with a record of 16-15. Five seniors graduate off the team — four of whom were starters. Miss the game? Listen to the action in its entirety here!